Latitude 49.437841 Longitude 2.554598. Located about 2 miles south-west of St Peter Port on the island of Guernsey is the parish of St Martin with it’s medieval church. The church stands beside Le Grande Rue, a site that was originally a pagan one but was Christianised in the 6th century AD by Celtic missionaries from Wales and the west of England. In the churchyard there is a large granite standing stone menhir that was carved into a female form some four thousand years ago and is said to represent an earth goddess or earth mother figure, hence the name La Gran’ Mere – the grand-mother. The granite statue menhir stands guarding the entrance to the churchyard of St Martin’s parish church and is between 5-6 feet high. Dating from around 2,000 BC when it was probably a square-shaped standing stone or “long stone”, it was fashioned into a female figure with head and shoulders in either the Celtic or Roman period. The carvings are of a typical female figure, an earth mother form that depicts a pagan fertility goddess which, rather strangely, guards and protects a Christian church. Perhaps the old pagan goddesses still have their uses! Newly married couples would, and still do, place coins or flowers on the statue’s head and shoulders to bring them luck, seeing it as a fertility symbol perhaps. In the 16th century a disgruntled churchwarden decided to split the stone in two, regarding it as a pagan relic, but the local people rallied round and restored the statue. The split in the stone can still be seen today. 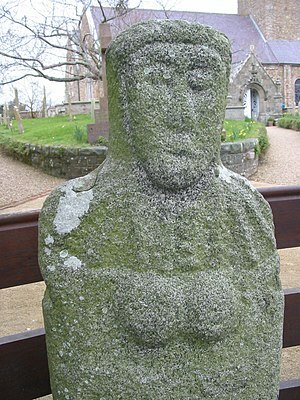 There is another similar standing stone figure in St Marie’s churchyard at Castel on the west coast of the island, although that one is much more defaced. Categories: Standing Stones, Statue Menhir St Martin's Guernsey | Tags: La Gran' Mere Du Chimquiere at Saint Martin in Guernsey Channel Isles | Permalink.